The Nucleonica team will make a presentation at the forthcoming meeting “New developments in radiation protection and their application in practice” to be held in Munich on the 11-12th June 2012. Early in 2012, a new 8th Edition of the Karlsruhe Nuclide Chart will be released containing information on many new nuclides and isotopes and updated nuclear data. In addition to the brochure with fold-out Chart and Wall-Chart, we are planning a new Auditorium Chart. 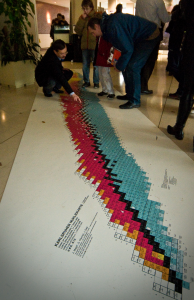 The first product now available is the Karlsruhe Nuclide Chart as a Nuclide Carpet with dimensions 100 cm x 650 cm. This special Floor Chart is a tremendous eye catcher and has been developed specifically for exhibitions, reception and communal areas in your organization, libraries, etc. If your organization is interested in obtaining such a Floor Chart, please contact us.